Upon arrival at the airport, head to the arrival hall and door number 3 near the information counter. Look for a driver holding a G Adventures sign with your name, who'll take you to your hotel so you can check in and start exploring. Travel to Kanchanaburi, home to the "Bridge on the River Kwai." 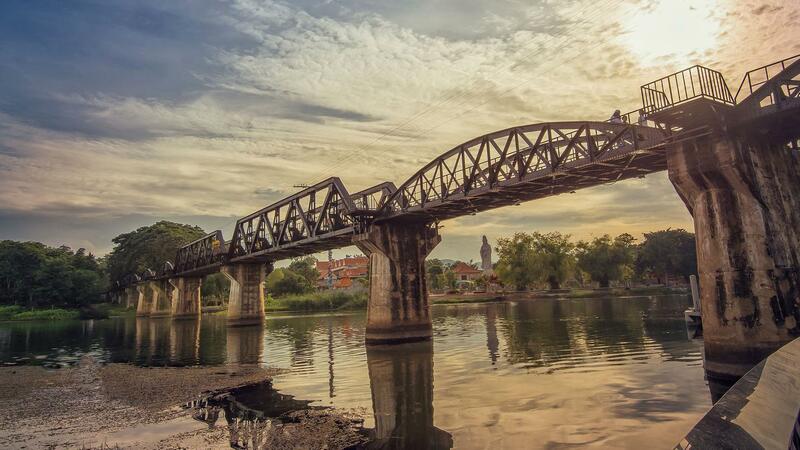 Take a train journey over the bridge and marvel in a piece of World War II history. Take in a piece of World War II history on this visit. You've seen or at least heard of the famous movie, "Bridge on the River Kwai" - tour the real thing and take a train ride over the bridge. It's massive, majestic, and imposing, and offers fabulous views of the river below. Enjoy a morning visit to Erawan National Park and waterfall then visit the Thai/Burma War Museum and War Cemetery. This afternoon, travel to Ayutthaya and enjoy dinner on a converted 1930s rice barge. Visit one of the world’s most beautiful waterfalls. Its seven tiers offer a unique experience at every climb, reaching up to 1,500m (4921 ft). Swim in the turquoise pools, snap photos from the top tier, and opt to hike in the jungle to spot monkeys. Visit the Allied War Cemetery, the Thai-Burmese Railway Museum, and JEATH (Japan, England, America, Thailand and Holland) War Museum to learn about the Death Railway's dark history. More than 6,000 prisoners are buried at the cemetery. Cruise down the river aboard a converted 1930s rice barge. Have a delicious Thai meal while taking in the incredible views of the city. Explore the UNESCO World Heritage-listed Ayutthaya Historical Park, which served as Thailand’s capital from the 14th to 18th centuries, when it ranked as one of the most magnificent cities in the world. Later, return to Bangkok and catch a flight to Chiang Mai. Travel to the nearby countryside and enjoy a khantok-style dinner - a must-do when you reach northern Thailand. 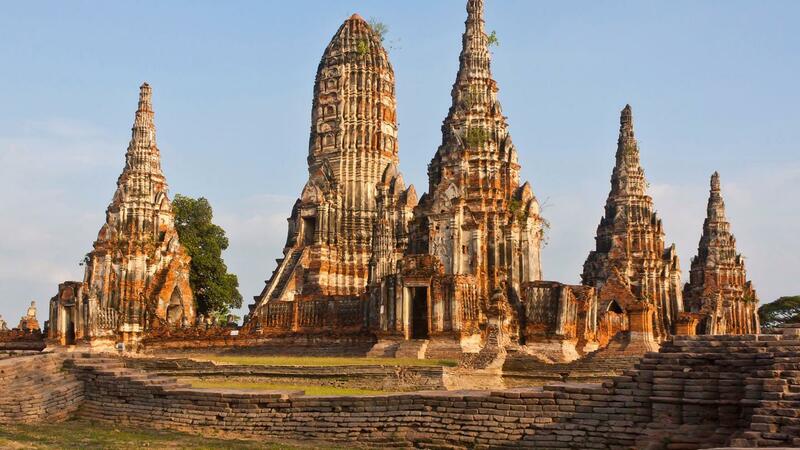 Explore the ruins of Ayutthaya, a UNESCO World Heritage site. Ayuthaya served as Thailand’s capital from the 14th to 18th centuries, when it ranked as one of the most magnificent cities in the world. Late in the 17th century its population reached one million, and foreign visitors wrote awestruck accounts of its size and splendour. Enjoy a unique stay in a village just outside Chiang Mai at a traditional family-run guesthouse. Structured as a social enterprise, Joy’s Guest House supports the Children's Shelter Foundation providing a home and education to 45 underprivileged children from the hill tribe villages of North Thailand and Burma. In addition to schooling, older students also have the opportunity to receive hands-on training at the guest house, preparing them for careers in hospitality and tourism industries. This evening, relax in the tranquil surroundings and sit down to an authentic Khantoke dinner - dishes typically include sticky rice, hang-le curry, and crispy pork with chilli paste. The next morning enjoy the pool and gardens or opt to take a yoga class or have a massage at the spa. Visit the local markets with a chef to collect ingredients to use in our Thai cooking class at a private culinary school, the results of which we'll enjoy for lunch. Later, we'll visit the historic Wat Chedi Luang and sit down with one of the young monks to discuss daily life and Buddhism. Listen to monks chanting at Doi Suthep Temple, one of the most stunning golden Temples in Thailand. 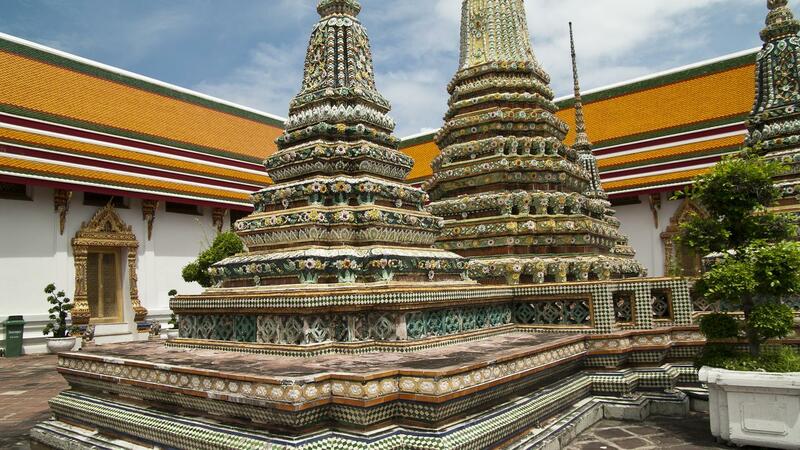 Visit the 14th-century Wat Chedi Luang Buddhist temple in the heart of Chiang Mai’s old city. Sit down with young monks to discuss daily life and Buddhism, and leave feeling spiritually refreshed. Monk Chats are informal discussions at a round table with a prepschool age Monk, usually accompanied by their teacher. Chiang Mai is a mecca for shopping and handicraft production, so take advantage of this opportunity to do some shopping if you wish. Pick up a a souvenir at this shopper's paradise. Wander through the market to find music, food, and local artists selling handmade crafts. 7 breakfasts, 1 lunch, 2 dinners. Allow USD100-130 for meals not included. Delve into the wonders of northern Thailand on an eight-day trip packed with unforgettable cultural experiences. Explore the serene Ayutthaya Historical Park, a UNESCO World Heritage site, and dine on a converted rice barge. Travel to a traditional village outside of Chiang Mai and visit a local family's guesthouse. In this place of golden Buddhist temples, rejuvenate your travel spirit - and stretch your understanding of the world. Take a train over the "Bridge on the River Kwai"
National Geographic Journeys Exclusives: Traditional Thai Guesthouse & Home Dinner, Chiang Mai. National Geographic Journeys Exclusives: Meet with Monks at Wat Chedi Luang, Chiang Mai. Hands-On: Cooking Class, Chiang Mai. Arrival transfer. Entrance to the Thailand-Burma Railway Centre war museum and train ride. Visit to Erawan National Park. Guided tour at Ayutthaya Historical Park. Dinner on a converted rice barge. Sunset visit to Doi Suthep monastery. Explore Bangkok and take a klong boat ride. Internal flights. All transport between destinations and to/from included activities. Take a train over the "Bridge on the River Kwai", Visit the UNESCO World Heritage site Ayutthaya Historical Park, Take an authentic Thai cooking class with a local chef, Discuss Buddhism with the monks at the Wat Chedi Luang temple. Optional Activities : USD150 for optional activities not included in the trip. Dollar-a-Day Program G Adventures’ Dollar-a-Day Program provides travellers with the opportunity to give back to the people and places visited on our tours by donating one dollar for every day you are on trip. 100% of these donations go directly to support community development projects worldwide that are implemented by Planeterra.